Approached by a private driveway and surrounded by wide, lawned tropical beachside gardens, Baan Taley Rom offers guests an attractive, modern and very private luxury residence with stunning views from almost every room out across the glittering waters of Andaman Sea. 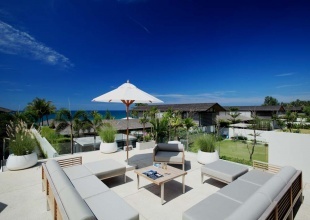 Villa Aqua at Sava Estate is a contemporary 3-storey sea view residence just a few metres from one of Thailand\'s most unspoilt stretches of sandy beach at Natai, in the province Phang Nga. A chic, contemporary 3-storey ocean view villa located just a short stroll from one of Thailand\'s most beautiful beaches, Natai, in the province Phang Nga. Villa Roxo is the perfect holiday choice for families with older children, or groups of friends in search of an exclusive, private escape away from the busy tourist beaches in nearby Phuket or Khao Lak. Baan Hinyai is a tropical dream destination that takes the concept of indoor/outdoor living to the next level. 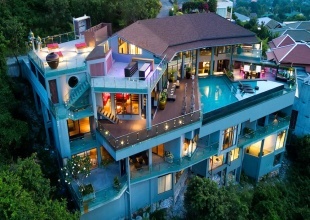 Located on the southeast coast of Koh Samui, this villa is located just twenty-six feet from the Namuang waterfall and a ten minute drive from the town of Lamai. 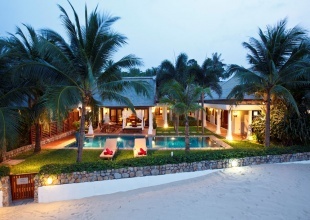 For groups up to ten, the elegant blend of modern design and Thai charm make Baan Hinyai an ultimate beachside villa. Acacias four bedrooms are carefully designed around a delightful central garden featuring a captivating tropical water feature. Alongside a well equipped private gym, at the gardens rear is a pavilion with two twin bedrooms, each with its own stylish bathroom. You cannot beat the spectacular views over Koh Phangnan and Ang Thong Marine park! 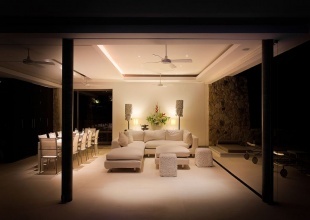 With both modern Thai and antique Asian furniture complementing one another, the Villa is an interior designer\\\'s dream and is unique in its architectural design. 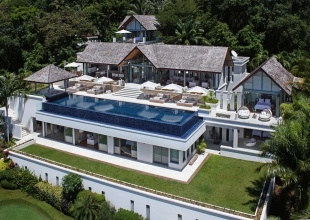 Villa Chan Grajang, an exceptionally high-end luxury villa rental located in the most desirable Surin Hill in Phuket, Thailand, is a three minute-drive from Surin Beach, and a half an hour drive from Phuket International Airport. Nestled amongst striking rock outcrops, this villa has four large double bedrooms with en-suite bathrooms and private terraces. The master bedroom has an adjoining study/powder room that can be converted into an additional children’s bedroom. A large infinity pool with an exceptional view and expansive sun deck frames the open-air dining area and relaxation lounge. 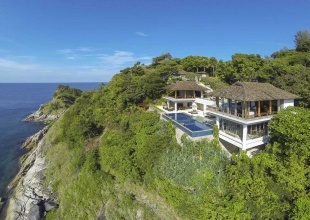 Designed over multiple levels and layered into the natural rock formations rising from the coast, the design of this villa is contemporary with minimalist décor. Offering four spacious bedrooms, each room has an en-suite bathroom and opens onto a private terrace. At the heart of the villa is an open-plan living area flanked by a slate-tiled infinity-edged pool. 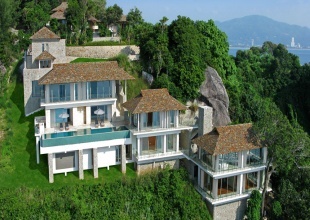 This phenomenal villa represents how far Samui has come in terms of architectural innovation, style and sophistication. Exceptionally well designed, every bit of space has a function, and there’s a surprise around every corner.Baan Jakawan is a very large seven bedroom property, but it’s more than just another high-end villa.